Alec Coles is CEO of the Western Australian Museum, the State’s museum with branches in Perth, Fremantle, Geraldton, Kalgoorlie and Albany. Coles has held this position since March 2010. He was previously Director of Tyne & Wear Archives & Museums in North East England, a post that he held for eight years where he was also lead officer of the North East Regional Museums Hub. Prior to that, he was CEO of the Northumberland Wildlife Trust, a wildlife conservation charity in North East England. In the UK, Coles was a member of the Heritage Lottery Fund’s Expert Panel and an executive member of both the National Museum Director’s Conference and the Museums Association. 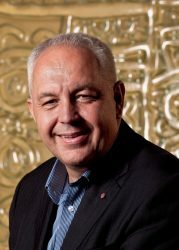 He is now an Executive Member of the Council for Australasian Museum Directors and Vice-Chair of ICOM Australia. Coles is committed to developing and demonstrating the public value of museums. He is driving Western Australia’s initiative to build a new State Museum in Perth and aspires to create a museum that is owned and valued by all West Australians and admired by the world. Coles was recognised for Services to Museums in the Queen’s Birthday Honours List in 2010, being made an OBE.